Photographers shot innumerable pictures of the black civil rights struggle between the close of World War II and the early 1970s, yet most Americans today can recall just a handful of images that look remarkably similar. In the popular imagination, the civil rights movement is remembered in dramatic photographs of protesters attacked with police dogs and fire hoses, firebombs and shotguns, tear gas and billy clubs. 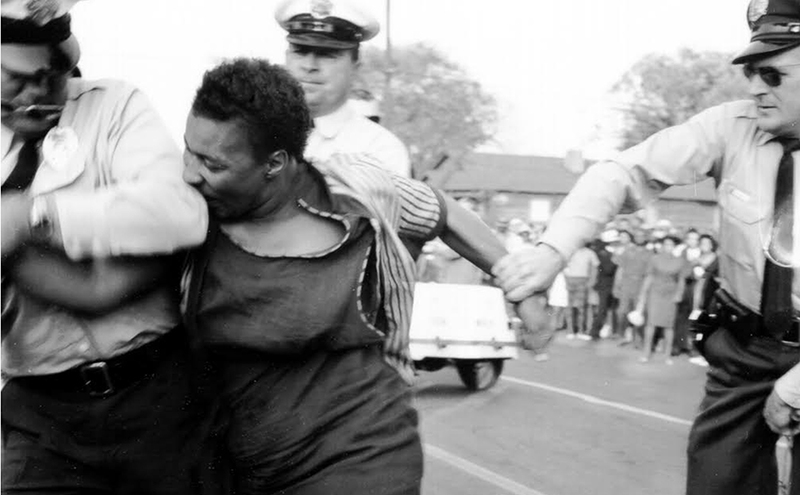 These best-known images of the civil rights struggle show black Americans as non-threatening victims of white aggression. Though this imagery helped garner the sympathy of liberal whites in the North for the plight of blacks, it did so by preserving a picture of whites as powerful and blacks as hapless victims. Berger’s argument that the most iconic images of the civil rights era are subtly patronizing is augmented with a series of news photos that tell a different story from the one disseminated by LIFE and LOOK publications. Blacks changed America through their action, not their suffering. Berger’s selection of forgotten photographs illustrate the action, heroism, and strength of black activists in driving social and legislative change. Freedom Now! highlights the power wielded by black men, women, and children in courthouses, community centers, department stores, political conventions, schools, and streets. The exhibition presents photographs rarely seen in the mainstream media, which depict the power wielded by black men, women and children in remaking U.S. society through their activism. Freedom Now! reveals that we have inherited a photographic canon—and a picture of history—shaped by whites’ comfort with unthreatening images of victimized blacks. And it illustrates how and why particular people, events, and issues have been edited out of the photographic story we tell about our past. By considering the different values promoted in the forgotten photographs, it’s hoped that viewers will gain a fuller understanding of African-Americans’ role in rewriting U.S. history. Martin Berger, Professor, History of Art and Visual Culture, UC Santa Cruz; exhibition organized by AD&A Museum at UC Santa Barbara. Martin Berger is Acting Dean of the Arts and Professor of History of Art and Visual Culture at the University of California at Santa Cruz. He graduated from Wesleyan University with a B.A. in English and Art History and received his Ph.D. in American Studies from Yale University. Before arriving at Santa Cruz in 2005, he taught at Northwestern University, UNC Chapel Hill, SUNY Buffalo and Yale. Professor Berger has held fellowships at the Smithsonian Institution, Stanford Humanities Center, and the Sterling and Francine Clark Art Institute. He is the author of three books and an exhibition catalog: Man Made: Thomas Eakins and the Construction of Gilded Age Manhood (2000), Sight Unseen: Whiteness in American Visual Culture (2005), Seeing through Race: A Reinterpretation of Civil Rights Photography (2011), and Freedom Now! Forgotten Photographs of the Civil Rights Struggle.